A star halfback in college, Garrett rushed for 3221 yards including 1440 as a senior in 1965 when he was awarded the Heisman Trophy. He was chosen by the Chiefs in the 20th round of the 1966 AFL draft (the Los Angeles Rams selected him in the second round of the corresponding NFL draft).A collegiate baseball standout as well, Garrett also received a big offer from the Pittsburgh Pirates.The Chiefs won the bidding war. While there were doubts as to if Garrett had the size to succeed professionally, as a rookie he alternated with HB Bert Coan and with his speed and aggressiveness rushed for 801 yards as Kansas City went on to win the AFL title. He added 56 yards in the postseason, including the first Super Bowl. Chiefs went 9-5 to finish second in the AFL Western Division. Slowed by injuries in 1968, Garrett’s rushing total dropped to 564 yards, although he also caught 33 passes for 359 yards (10.9 avg.). and totaled 6 TDs. 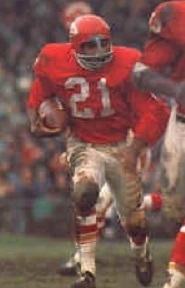 He led the club with 732 rushing yards in 1969 and KC won the last AFL Championship and the Super Bowl. Garrett flirted with a switch to baseball and was dealt to the San Diego Chargers during the 1970 season. He remained with the Chargers through 1973 and ran for 1031 yards in 1972. Garrett compiled a total of 5481 yards on 1308 rushing attempts (4.2 avg.) with 3246 yards on 736 carries occurring while with the Chiefs. He also caught 238 passes for 2010 yards (8.4 avg. ), 141 for 1231 yards while with KC. He scored a total of 49 TDs. Garrett received consensus first-team All-AFL recognition once, some second-team recognition after two other seasons, and was selected to two AFL All-Star games. He went on to earn a law degree and eventually served as athletic director at USC and California State-Fullerton.